We’re excited to announce a new feature that we’ve been working on – Ticket Bundles. Ticket bundles allow you to sell discounted tickets from multiple events with one transaction. To create a ticket bundle, head over to your dashboard and select the BUNDLE option from the left side navigation. You will need to name your bundle, set a delivery method, and set a quantity. Once that quantity is reached, the bundle will be sold out. Next, you will need to add tickets to your bundle. To do so, press “+ New Bundle Price Tier”. From there, you will select the event and then the ticket to add to your bundle. Last, you will set the bundle quantity and price. Bundle quantity is the number of times a price tier will appear within the bundle. Bundle price is the price that will be charged for that tier. For example – if I am creating a “Couples Weekend Bundle” – I would select my ticket, set the bundle quantity at 2, and set the price at $90 (down from the standard $100 price). Repeat the instructions above in Step 2, adding every ticket you want included to your bundle. Once all price tiers have been added, move on to Step 4. Add your bundle to an event, or multiple events. This is where the option to purchase your bundle will appear. That’s it – congratulations! You have created your first bundle. 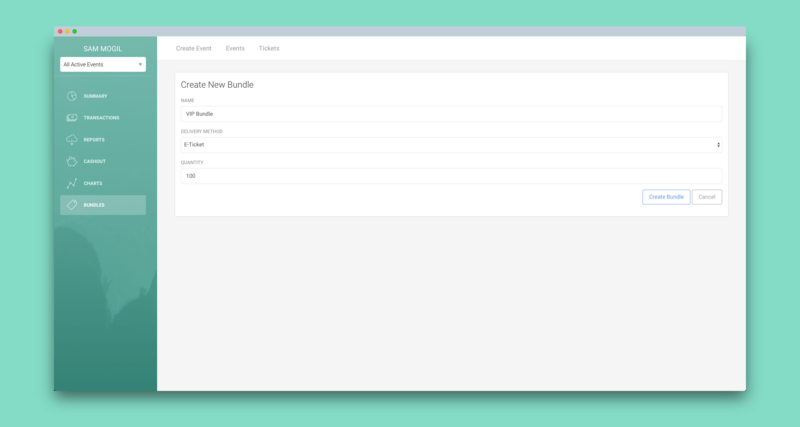 You can go in and create additional bundles, or edit current bundles from the BUNDLES tab in your dashboard. There is no limit to the number of bundles you can create, nor the number of tickets you can add to a bundle. You can also attach the bundle to as many events as you would like. Please reach out to sam@squadup.com with any feedback or questions.